HomeSecurity Camera Support ForumWiring and PowerPWR-8 only 250ma each channel? On the board it says 250ma output per channel. But the specs say its a 4A power supply. Having used Altronix in the past that usually meant you had 4A divided by the number of channels, and no more than the fuse rating per channel. On the white label on this box it says the PT fuse is rated 650ma. Yet it only allows 250ma per channel? If its a 4A at the least it should be 500ma or in this case based on the PT fuse, 650ma per channel but no more than a total of 4A. I know these are not isolated outputs – especially based on the rolling bar in the AF domes using the 16-ch UL listed power supply. Whats the deal with these power supplies, the 4 and 8 channel in particular? Also, that isnt enough to power the Auto Focus domes which draw approx 800ma (9.6watts) according to the specs? It looks like Im going to have to buy a bunch of extra power supplies just to power the AF domes, and if this 250ma per channel is correct, I wouldnt be able to power ANY of the cameras we bought from you guys. Before I burn up the cameras using an underrated PSU, please verify the output for each channel of the 4 and 8 channel power supplies you sell, and also please let us know which power supplies work with the AF domes (for the future, for now I will have to buy 5A power supplies locally for $100 each and just splice all the cameras power into them). Here are images showing the power supply ratings. 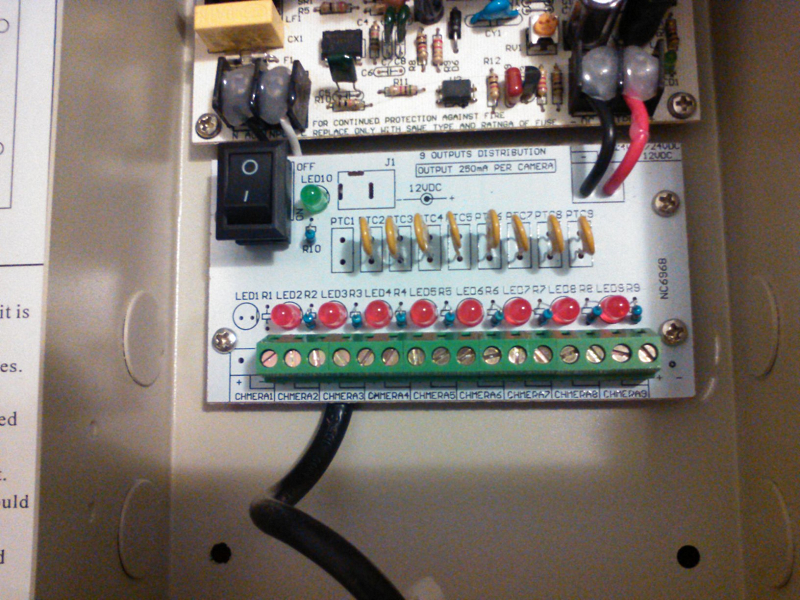 Also the PSU says it is a 9-channel, but it only has 8 +/- terminals. First, I tested the amp usage for both the mini dome and the Auto Focus dome. The mini dome was 160-190ma (specs say 208ma) and the AF dome was 160-260ma – 260ma when the motorized lens was in use. This is a big difference from the specs of approx 800ma. Also I hooked the mini dome and the AF dome on the 8-channel PSU, the one that claims 250ma per channel, or 650ma PT fuse. 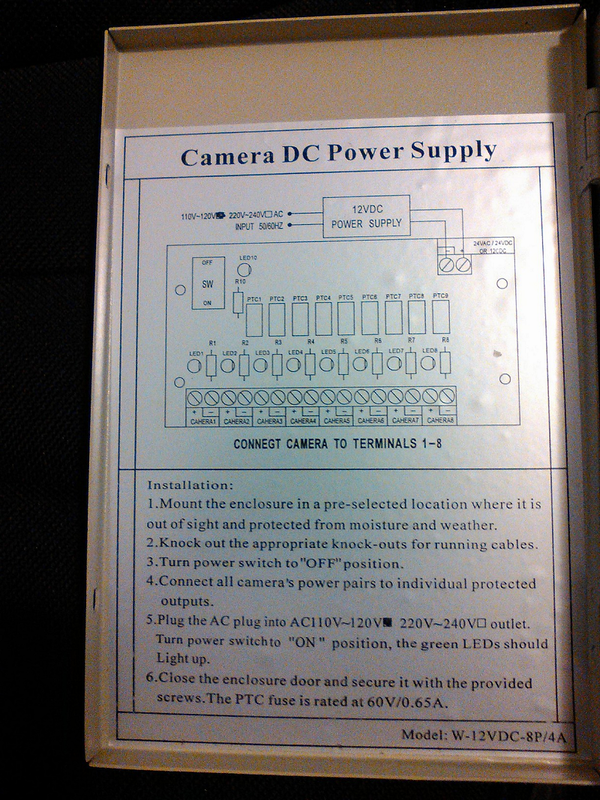 Both work fine on this power supply, the AF dome has no lines when zooming, except I saw 1 very small line maybe once. Not sure if it’s safe to actually leave them on this PSU though, given that 250ma output writing on it. On another brand 16-ch PSU there are lines when zooming in and out with the AF dome. I also saw that before at another place. The only other thing I can think of they all have in common – UPS. I do not have a UPS here, so I will do some more testing at a location with a UPS. Somewhat related, using the Manual focus 2.8-12mm eyeball dome, one had interference in IR (same room as the DVR, no power near it or the wire). So I changed the wire and connectors, still had it. I changed the power supply for a plug in adapter, fixed the problem. There are a few of that type on the same PSU, no issues with them. I wonder if I can simply have a bad PSU, I may try a different PT output and see if that fixes it. The max amp per a channel is .65 amps with a total of 4 amps. Okay thanks, so ignore the writing on the power supply board that says 250ma output per channel? I just want to verify that, also if these will power the AF domes safely. It seemed to power it just fine, but I would like to verify that from you guys to be safe. Thanks. I would say what is printed on the board is inaccurate unless you wanted to use all 8 channels then you would have to have cameras that required less amps. Add Reply: PWR-8 only 250ma each channel?